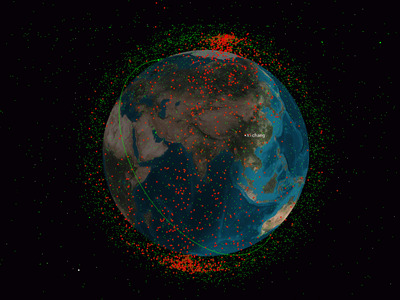 NASA’s Goddard Space Flight Center/JSCAn illustration of a field of orbital debris, or space junk, circling Earth. China’s Tiangong-1 space station recently crashed to Earth as a giant chunk of space junk. 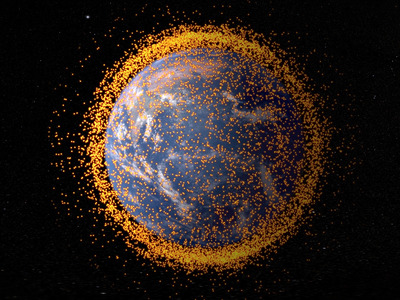 In 2017, the US government logged 308,984 close calls with space junk and issued 655 “emergency-reportable” alerts to satellite operators. 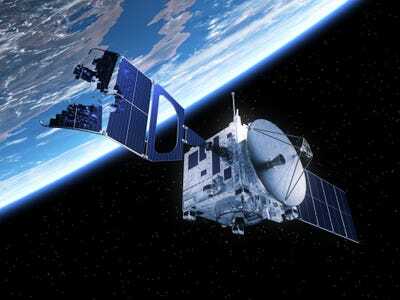 There are about 23,000 satellites, rocket bodies, and other human-made objects larger than a softball in orbit. There may also be some 650,000 softball-to-fingernail-size objects and 170 million bits of debris smaller than the tip of a pen – stuff like flecks of paint and fragments of explosive bolts. There’s a real risk that something may smash into something else up there, and it often does. Each piece of junk is screaming around our planet at roughly 17,500 mph, or 10 times faster than a bullet. Jack Bacon, a senior scientist at NASA in 2010, told Wired that a hit by a 10-centimeter sphere of aluminium would be akin to detonating 7 kilograms of TNT. 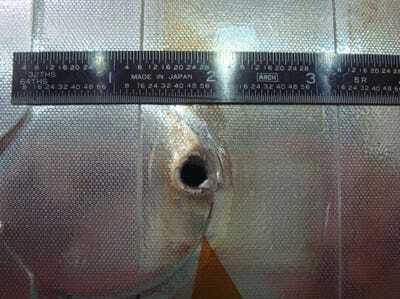 NASAA piece of space debris punched this hole in space shuttle Endeavour’s radiator. Led by the US military, the SSN uses an global network of partners to identify, track, and share information about objects in space – especially any potential close calls. A vivid example of the Kessler syndrome is in the movie “Gravity,” in which an accidental space collision endangers a crew aboard a large space station. NASAThe Haystack and HAX radars located in Tyngsboro, Massachusetts. These radars collect 600 hrs of orbital debris data each per year and are NASA’s primary source of data on centimeter-sized orbital debris. The SSN enlists the help of commercial companies and friendly governments around the world to keep tabs on it all. 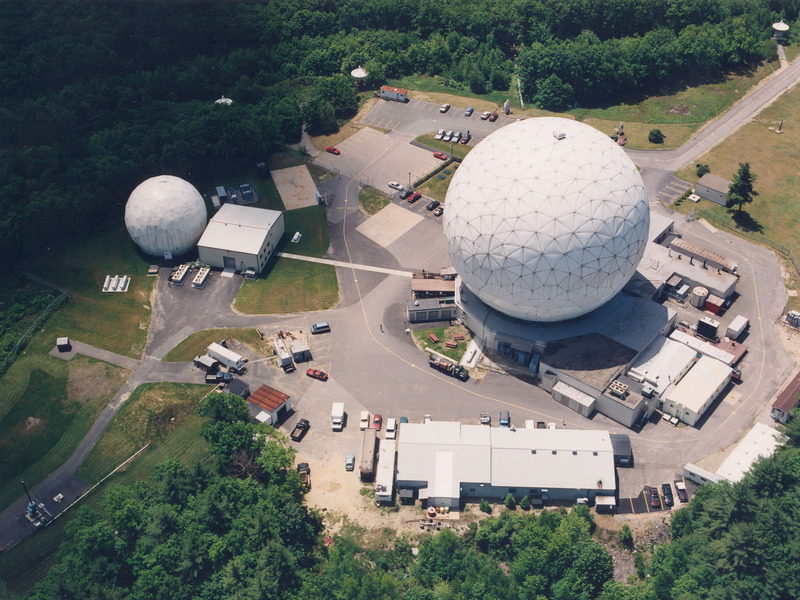 It uses about 30 different systems, and they come in four main flavours: satellites, optical telescopes, radar systems, and supercomputers. The radar observatories can see things in space even when it’s daylight, which is crucial for frequent, almost real-time tracking. 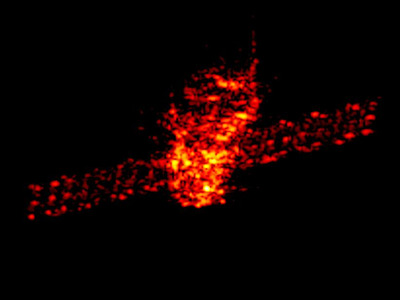 In fact, just before Tiangong-1 fell to Earth, a radar observatory managed to image the plunging spacecraft in impressive detail. Fraunhofer FHRThe main body and the solar panels of the Tiangong-1 in a radar image. Optical telescopes on the ground also keep an eye out, though they aren’t always run by the government. “The commercial sector is actually putting up lots and lots of telescopes,” Jesse Gossner, an orbital-mechanics engineer who teaches at the US Air Force’s Advanced Space Operations School, previously told Business Insider. The government then pays for their debris-tracking services. Observation data from these systems is fed to supercomputers, which help calculate an orbit and check against a catalogue of known space debris and orbits. If there’s no match, the object is flagged and added to a list. Crucially, the SSN supercomputers constantly check the orbits of all satellites and known bits of space junk to see if there’s any risk of future collision days in advance. Celestrak/Analytical Graphics, Inc.China destroyed its own FY-1C satellite in 2007, creating countless pieces of space junk, shown as red dots. Green dots show satellites in low-Earth orbit. Of these, “only 655 were emergency-reportable,” she told Business Insider in an email. 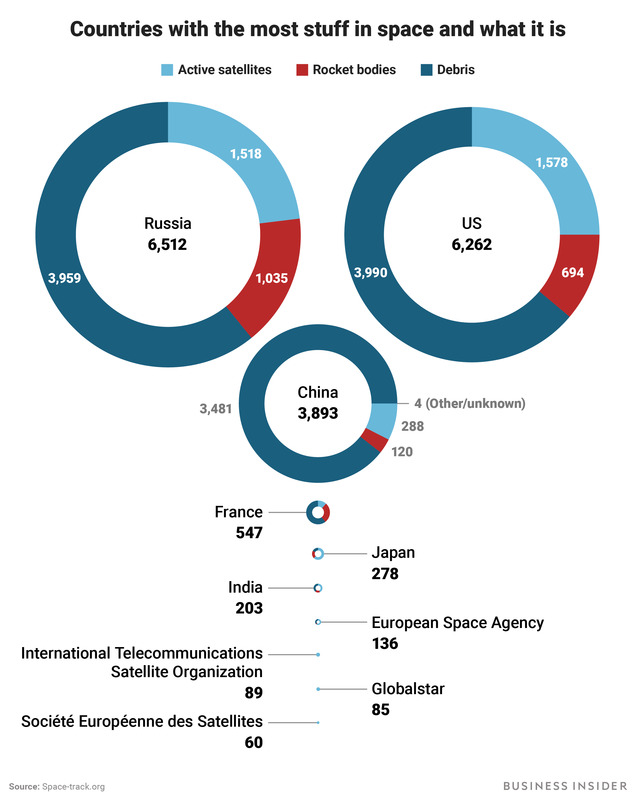 And of those 655 reportable emergencies, some 579 close calls were in low-Earth orbit, an area that’s relatively crowded with high-value satellites. ShutterstockAn illustration of a satellite damaged by space debris. When a space company receives a SSN alert, they typically move their satellite into a different orbit – and out of harm’s way – by burning a little propellant. 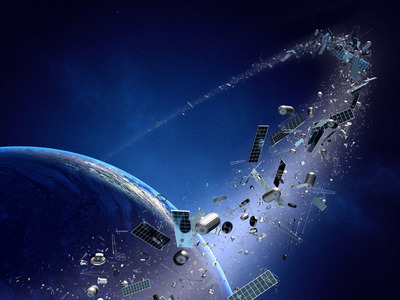 ShutterstockA thick ring of space junk orbits Earth in this fanciful artist’s concept of a ‘Kessler syndrome’ event. In Gossner’s eyes, the best way to manage space junk isn’t with high-tech space nets and other debris-catching technologies. For now, current tracking and warning efforts have led Gossner to believe we’re not at risk of a Kessler event.